It only took one viewing of Disney's Tangled for it to become a favorite for our family. 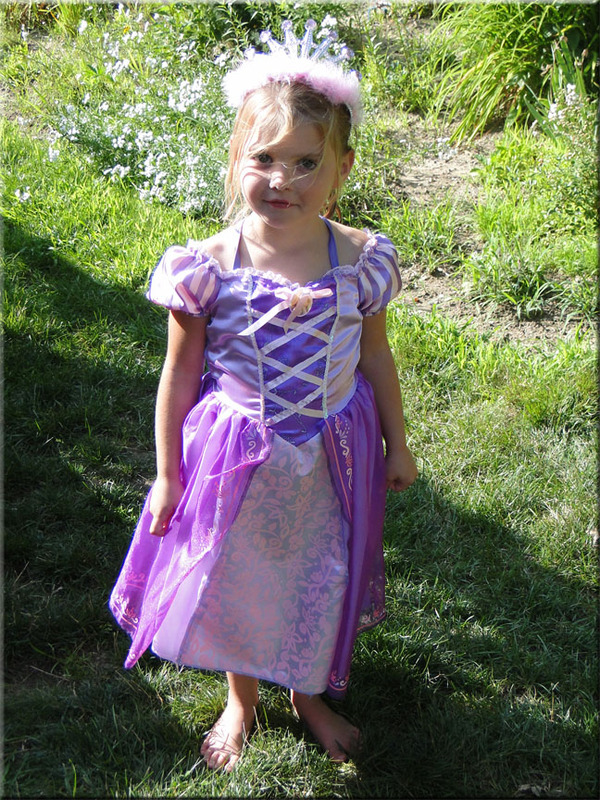 It is the perfect movie for my kids, because it has the element of a princess with Rapunzel, as well as the adventure side with Flynn Rider. Emily just loves Rapunzel; Joey loves Maximus and Flynn Rider; and Hayley loves them all. This is one of the movies that all three of my kids laugh out loud, especially at the interactions between Maximus and Flynn. We decided for this month to take our love of Tangled and use it as inspiration to create a pasta salad with, of course, spaghetti. As with all the recipes I share, use the ingredients that appeal to your child's taste. You will see in the ingredients list to cut the vegetables and slices of meat into flower shapes. Your child can use small, metal cookie cutters for this, which always is a little extra motivation for my children to eat their vegetables. 1. Prepare spaghetti according to package directions. When it is done, run it under cold water to stop the cooking process. 2. While the spaghetti is cooking, place the dressing, vegetables and meat into a large bowl and mix well. This will give these ingredients a chance to marinate in the dressing. 3. 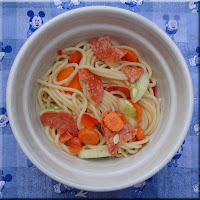 When spaghetti is cooled, add it to the vegetables and dressing and mix well. 4. Sprinkle Parmesan cheese over the top and serve. 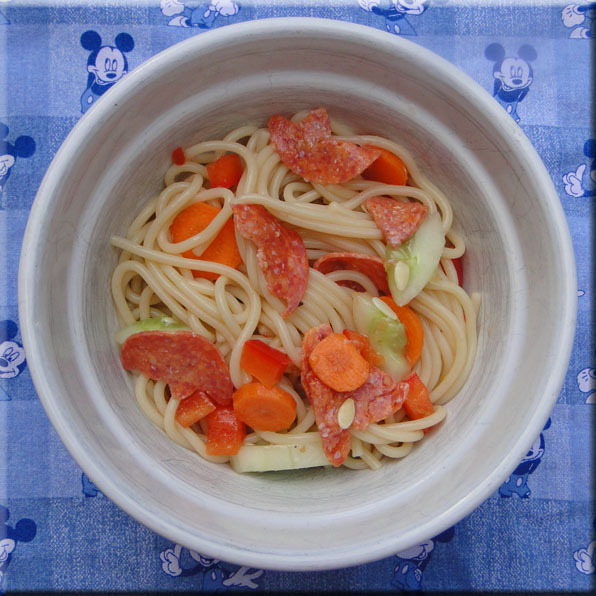 Just a note, my kids will eat spaghetti plain, so we added minimal dressing and Parmesan cheese to this salad. You may need to adjust the amounts for your family's taste. Also, if the pepperoni is too spicey for your child, ham would be a delicious substitution. looks delicious - and maybe i can get my littlest to eat too - for some reason spaghetti is "yukky" while other noodles (with butter) are delish. The minds of 3 year olds never cease to amaze me. :-) thanks for sharing!